An oil rig lays on its side after an incident at an oilfield near McCook, Sept. 25, 2017. EDINBURG — It may take as long as a month before the findings of an investigation into a fatal oil rig incident are known. At about 10 a.m. Monday, Alton fire personnel and deputies with the Hidalgo County Sheriff’s Office responded to a an oilfield in rural Edinburg, where an oil rig tipped over and trapped one man underneath, killing him, and seriously injuring another who was inside the rig at the time. 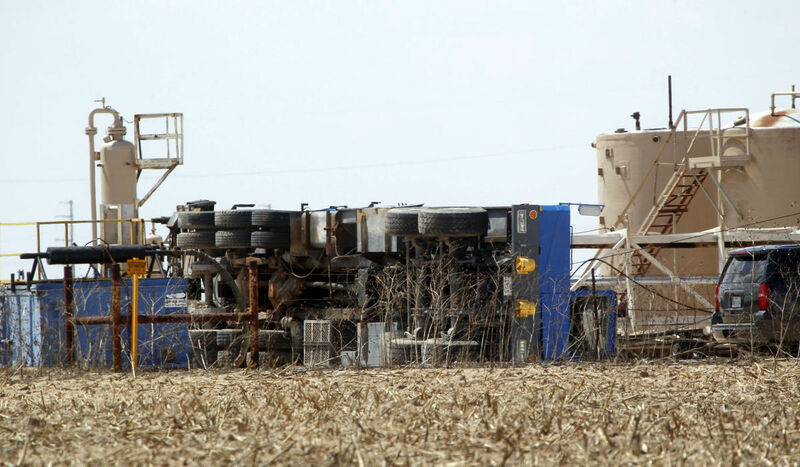 The men, who have yet to be identified, were working in an area north of Edinburg near McCook Acres and Moorefield Road when for reasons unknown, the rig they were working on tipped over, Alton Fire Chief Javier Garcia said Monday. There were no oil spills, leaks or threats to the general public despite the incident, Garcia said. Chauntra Rideaux, Dallas regional director for public affairs for the Occupational Safety and Health Administration, confirmed earlier this week that an investigation was underway but that it is likely to take up to a month for details of the investigation to be made public. The sheriff’s office, who is the lead agency into the accident, released few details on Monday. Calls made to the sheriff’s office for an update on their investigation have gone unreturned as of press time. The condition of the man transported by helicopter to a local hospital in Edinburg also remains unknown, and the name of company that employed these men has not been released by authorities. Just last month, CBS 4 News reported that a Raymondville man died in an oilfield accident in West Texas. According to the U.S. Bureau of Labor Statistics’ most recent findings, fatal injuries in the private oil and gas extraction industries were 38 percent lower in 2015 than 2014. “The private mining, quarrying and oil and gas extraction industry recorded fewer fatal injuries in 2015, declining 34 percent to 120 fatal injuries from 183 in 2014,” according to the labor bureau’s statistics.